Professionally, I have been a bit of a stinker this holiday season. My basement glazing area is full of pots to glaze, as is my slab roller upstairs in the "regular" studio. Honey pots, mugs, teapots, platters, even butter crocks. They sit, sad and abandoned, waiting until I'm ready to work on them again in January. I stocked my shelves at one store in town, made sure another client was taken care of, and made some special order Christmas ornaments for a friend's business and another set for a local church. I have a small kiln-load of glazed ornaments to give as gifts, and a few other special pieces I want finished- some icon-like pieces, a belated wedding gift, and some bowls for a special friend. I've still been working- developing, hand-building, glazing, shipping, but I don't have much to show for it. It is very strange to me that I don't feel guilty about this at all. I'm content to sit and draw and think and knit or cook something. Stranger still, I have nothing but one class on the calendar for 2012. No markets, no fairs, nothing. And I'm fine with that, as well. I am excited about my back door. Several weeks ago I took a pair of klompen that some college roommates had bought for me in Holland, painted them yellow, and nailed them to the back of my house. Planted them with johnny jump ups. I bought a second pair from another college friend who sent me another pair and a single. Last night I drilled, nailed, and planted them all. They make me exceedingly happy. I'm looking for a red pair, and maybe a plain wooden shoe to paint blue, to finish off this wall, but, dreaming big here, I'd like to have an entire wall filled cheek-to-jowl with planted klompen. Call me crazy, but it makes me happy. I'm signing back off until, oh, almost January. I hope your holidays are merry and bright and joy-filled and peaceful. Last week I put up a little sneak peek of a bronzey green bug that was part of a super top-secret project. Here's the full thing- a birthday gift for my friend Doug who ties VERY realistic bug flies. I gave it to his sweet wife April tonight at knit night. Since I've already heard from him, I can show it to everyone now! I ran out of my normal green overglaze, so I used the green that I normally use to paint my ferns on my botanical pottery. 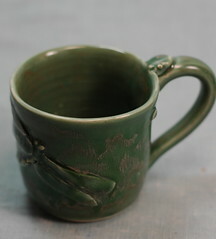 I think the resulting green is more boggy and masculine than the normal "deep celadon" glaze. I put a stink-bug-ish bug up at the top of the handle after finding a brilliant green shield-shaped bug on my shoulder during a hike one day. The dragonfly was made from a mold of a real dragonfly I found in a country post office parking lot about five years ago. There's a ladybug on the other side, and a beetle/flying bug on the other side, as well as my bee stamp. Ideally, the ladybug would have been red, but I was afraid of the piece looking cutesy if I'd glazed the bugs different colors. Cutesy is fine for a little girl, but not for a naturalist like Doug! I was very happy with the I showed in the sneak peak, so I might use it again with some fiddleheads somehow. The dragonfly is so large that the piece needs to be large enough to accommodate it- I haven't used it very much in the 6-7 years since I made it. Still, I'm happy I kept it. And I'm pleased with this piece. I haven't made any pottery at all in 2 weeks and said that I wouldn't until little boy goes back to school in mid-august. Today we read 4 chapters of Beverly Cleary's Beezus and Ramona, made grape juice, canned tomatoes (7 quarts, with another 5-7 still to process), and made a gallon of granola. Next week he has mornings at an art camp, so I may throw a tiny bit, but I'm enjoying the break! Oh, hi there. I'm back. I actually haven't left yet. I've been having an internal debate with myself over my pottery packaging materials and my greening desires. At my house we recycle all we can, use CFLs on all of our lamps and overheads (except those with dimmers, because I can't find CFLs that work with dimmers), eat organic and local as much as possible, and it's all going really well except with my packaging materials. Boxes I don't worry about- they're recycleable and I reuse the ones that come to the house or recycle them in our bins. I reuse bubblewrap- I've only had to buy a single roll of bubblewrap this year, so that's not SO terrible. But you know what I hate? The foam in the tops and bottoms of my boxes. My dad and stepmother shipped medical/surgical devices for years- very delicate stuff- and always used egg-crate mattress type foam. It's wonderful stuff except for how its made. And that it's not exactly biodegradable. I've reused all of it that they've sent me over the years and am nearing the end of the foam that I bought- a single twin-sized piece that was $10 at the biggest big-box store that I don't like to shop at. I'm wondering if shredded/crumpled newspaper would work as well as it does. I dislike packing peanuts, although the corn-based ones are okay- though corn-based anything is another issue entirely. Pottery-making isn't exactly earth-friendly. Clay is mined, the glazes are toxic chemicals until firing, and the firing uses a LOT of energy. On the up side, all of my "throw aways" are recycled into mosaics or hung as garden art, I re-wet and re-use all of my clay scraps, slip, and pieces that crack or warp during drying, and most people don't just pitch a handmade pottery piece after a year or so, the way one might with a big-box dish. The production of my pottery doesn't bother my eco-consicence, but my shipping materials do. Okay. Now I'm packing, and I'll be back next week! Sometimes my life just feels that way. Sometimes ALL of our lives feel this way. Yesterday I did too much. Vacuumed because the coat of dog hair on my dining room rug was really getting to me. Grass out back is shin-high, so I used the weed eater. We have a tiny back yard, so it took 5-7 minutes, 10 minutes max. Mistake. Most of ya'll (friends, family, other blogger friends) know that I had a cone biopsy two weeks ago monday. It was a good thing- removing some bad bits before they got REALLY bad. Yesterday's activity loosened some clots and I was a mess- put on bedrest for the afternoon and night, up at dawn to make an 8am doctor's appointment way way out east of here. Poor Gary had to drive me. And I'm fine, I just have to not do anything that would break a sweat. No midnight dance party tonight. No more weed-eating. No problem! Before that happened, the first thing on our schedule was to put our dog down. Luther was crazy from day one. Anecdotal crazy I can deal with. He passed that point. Attacking the mail, biting little boy unprovoked, biting me when I tried to keep him from destroying the mail. I've had labs for 10 years. My dad has had them for 20. I've had 2 besides Luther (thankfully Birdy is still with us), but I've never seen a lab like him. After trying prozac (yes, the people kind) for more than a month, and after our kennel (owned by a wonderful couple who specializes in behavior training and offer classes that didn't put a dent in his brand of insanity) refused to have him back, we realized that there was a single solution. We steeled ourselves to taking him in, because when you start rationalizing that you don't really want to add to your family because of a pet, something is wrong. So please, laugh with me. And please don't think that I'm feeling sorry for myself, because I'm not, especially since I just read my friend Molly's essay on mothering during difficulty. My child is a trooper. Today's payday, and I've got the battery covered in this week's pottery sales. We made the right decision for our family, I learned what exactly my limits are, and that my friend Michelle, an OB/GYN nurse in SC, is a fabulous friend to have on call. It's so much nicer to call a friend to find out what to do than to a) bother your doctor if you don't need to (I did), or b) go directly to the ER (I didn't). Here's to the weekend, some nice wine, someone else's cooking, and a fresh batch of kid videos from our neighborhood video store. No pottery news, I'll get back on that next week. Oh! 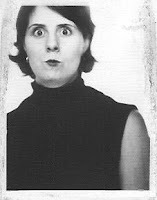 And, this picture is me in 2001, I think. I was 26 and sassy. Short hair did that to me. I'm home, I'm well, and best of all, I'm drugged. I may have new pottery to show you by Friday (um, I have to because that gift I keep breaking is due then). The kiln is firing tonight, even if someone else has to do it. thanks for all of the good thoughts and prayers. I've been having a bit of a hard time lately. Last week I got some medical news I'd hoped I wouldn't get. Nothing drastic or dreadful, but the sort that makes you realize that you'll be meeting your insurance deductible much sooner than you'd thought. And pottery is NOT going well. Because I need to meet that deductible, I tried to fire last night. This is the first oops. This is a platter for a dear friend that literally crumbled in my hands. And a half-dozen botanical dessert plates that went with it. They're on top of the first platter for said friend that broke in firing. Eerily reminiscent of that last thing that made me want to quit pottery. But I persevered and fired the smaller-than-I'd-hoped load. As I'm unloading this morning, I'm finding that the early morning trimming and too-dry pieces are indeed cracked. I had to pitch 3 in the mosaic pile, and a 4th lost its handle as I was waxing the foot. Better to lose it in my hand than a customers, but. . . . Despite the losses, I decided to get down to business. I was feeling really really sorry for myself. Poor Melissa. Stuff breaks. She has to work to earn money. Oh, life is so hard. Then the dogs and I hear a car in the drive. The car leaves. A 30 second stop. We go in to the front door to find a bag of homemade oatmeal-chocolate-butterscotch cookies hanging from the storm door. So I'm not all alone, and I'm reminded of my gratitude lenten observance and am grateful that I have work to do, orders to fill, friends and family who love me, and the insight to pull my head out of that dark place, get my work done, and take my child to the children's museum to enjoy his summer. Thanks for the chance to reflect, and thanks for the cookies, unseen friend. Well, not for me. Not for my boys, either. But Luther sure enjoyed his first snow! It doesn't snow much in Memphis, maybe once a year we'll see some flakes, but accumulation is much less frequent than that. It won't stick this time since we were in the 70s Sunday and Monday (that was yesterday! ), but it is coming down like gangbusters. Pottery work is happening, but not so much to see when work involves shipping (yay! ), supplies, and computer work. I went to get new boxes for my etsy sales, recalculated my shipping charges based on the weight of each type of piece and plugging each weight into the USPS website for priority mail and insurance. Happily, I made accurate guesses, but some of my shipping charges have been lowered a bit. A few were raised: I'm not sure how I thought I could ship something priority for $4 when prices start at $4.60, but that's all fixed now. This is a learning process. Yesterday I bisque fired for the first time in a while- my kiln needs a new part, so I can't do a glaze fire yet, but that will happen soon. Then I'll have LOTS of new work to show you! Every year for the past three years Molly of the Mollycoddle blog hosts a miniswap for creative mamas and their children. I had just discovered blogs last year and looked on enviously at the fun swaps documented over at the miniswap group on flickr. This year, I signed up in time and the boy and I were paired with a lovely family, Amanda and William and baby Sasha, in Vancouver, BC. We picked up our package from the PO yesterday and were delighted by all of the goodies they made and picked out. This package was full of all of the excitement of a Chinese New Year parade (with candy, toys, lanterns, and a yoyo that big Luther dog mauled immediately), the beauty of a NW coast beach, cool recycled art materials, handmade finger puppets, and a rocking cd for the whole family to enjoy. I feel like I'm not even naming half of the gifts, but boy were we impressed. Our package was a bit of a challenge for me. Pottery would have been fun, but I had a 4 week timetable to work with. While I love to knit, my knitting time is under two hours a week. I sew, but what to sew for boys? I finally settled on some easy appliques- an apron, because my boy loves his so, and a tiny bag full of garden seeds. I also tried out (so late to this trend) a variation of the freezer paper stencils- both boys now have matching green and blue tractor tee shirts. A book, some stickers, a rubber duckie soap for baby, and a bucket of dinosaurs rounded out our big padded envelope. My boy loved this project so much that he wants to keep in touch with our swap partners- he "loves (my) friend William in Canada!" not this empty styro container, which held my take-home portion of tomato aspic on leaf lettuce with homemade mayonnaise and decorative paprika sprinkle. I MEANT to show you the pretty pretty yummy aspic. But I ate it. All of it. Lettuce too, and got a piece of bread to mop up the mayonnaise and paprika. Yesterday Gary and I had a lunch date at Calvary Episcopal Church in downtown Memphis. Every weekday during Lent they have noonday preaching and a waffle shop open for lunch. Gary had waffles with chicken hash. I have been dreaming of aspic for weeks- so I had the "salad plate," which consists of tomato aspic, shrimp mousse, chicken salad, and half a canned pear with cottage cheese, all atop lettuce, each served with a rosette of wonderful homemade mayonnaise and the aforementioned sprinkle of paprika. I also ordered and extra aspic to eat later in the week. I didn't think that meant Tuesday, but to be truthful, it was half-eaten by Monday night. Usually, I am a whole-foods eater- pure flavors, unadulterated by extra flavors, gelatins, chemicals. This is 1950s food, but in a purer form. Nothing but getatin in here that's objectionable to me. I SO enjoyed my 50s food. My birthday is coming up in a month, and I think that I'm going to have a Calvary Salad plate to celebrate. When the Waffle Shop check-out ladies asked if we enjoyed our meal, and "how was the aspic?" I had to profess my love for it and admit that when I made the same recipe for Easter two years ago, I ate an entire 9X13 pan of the stuff over Easter week. 2T each cider vinegar and lemon juice. I'd give out the shrimp mousse recipe, but it makes 3 10x 18 pans! *Duke's mayonnaise, made in South Carolina, without any sugar, is an acceptable substitute for homemade.